In today’s technological age, it’s much harder to get and keep students’ attention then it was a decade ago. Our students’ minds are filled with texts, e-mails, social media updates, and what’s going on with their friends. It’s a struggle to get our students to actually engage in active listening while we teach. How could there be any learning when students aren’t even listening? Many of us take the time to ensure that students are not only hearing the words that we speak, but actually taking a moment to let it soak in and really listen to them. While this may be quite a challenge for many of us, it is possible for students to actively listen as we teach. Here are 10 teaching strategies to help students listen today. Many times we are formulating what we want to say next, while trying to listen to what our students are trying to say. While we should be listening intently to every word, it can be quite obvious that our thoughts are elsewhere. Try modeling good listening skills by restating what the student talking has said. This will show your students that were listening to ever word they said. 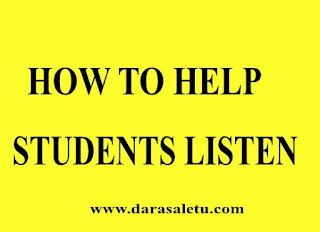 You can also use these teaching strategies to see if students were listening to you as well. Research shows that students are more likely to listen to a teacher who has taken the time to get to know them, versus those who have not. They are also more likely to listen to someone whom they know on a more personal level, than to someone who they do not. Take the time to really get to know your students, their hobbies, who their friends are, and so on. And let them get to know who you are. You can easily do this by playing a getting-to-know you game in the beginning of the school year, or having them fill out a student questionnaire. A wonderful way to sharpen those listening skills is to use a non-verbal hand signal. It can go something like this, "After I read the following statement, I would like to you to hold up one finger if you agree with it, or two fingers if you disagree with it.” This strategy asks all students to fully participate and it will be obvious if a student wasn’t paying attention at the end of the statement. Most of the time teachers spend the majority of their day talking and lecturing to students. But listening to you talk does not ensure that students are actually learning. What you want to do is talk less and have students talk more. Try several mini-lessons through the day where students listen for shorter periods of time, and talk amongst their group about what they are learning. Listening to others speak is just as informative as listening to you speak. With all of the educational technology that is out there today, why not give that a try? Carefully select a movie, documentary, or app that will teach students about what they are learning. Any of these ideas will be good alternatives. There will be times when students will miss what you said and instead of interrupting you to find out what that is, you can have them “check-in” with a neighbor. Each day give students a few moments to compare notes or talk with their neighbors about anything that they may have missed. If you really want your students to listen to you when you talk then you must hold them accountable for listening. Instead of giving them all of the notes or key concepts that they need to know, only give them half of them. The other half they will have to listen to you to get. By providing only an outline for them to follow, you are ensuring that they will listen to you as you speak. Whatever way that you decide you want your students to learn, have it be through you, a movie, or educational technology, have students listen for a purpose. When students have a purpose they are more apt to listen. So, next time you are teaching a lesson, pause after a few minutes and have students write down a question that they have about what they just heard. It’s easy to drift to never-never land when you know what the teacher is going to say. Be sure to break the monotony of your lessons and you school day to ensure students are always on their toes. If they think they can be called upon at any time to answer a question, they will be more apt to listen. What are some way that you encourage active listening in your classroom? Do you have any tips that you would like to share? Please leave your thoughts in the comment section below, we would love to hear them.